Every time Linda Ryan, 50, thought she was in the clear, that she didn't have to worry about cancer anymore, her hopes were dashed. Linda, of DeLand, Florida, was diagnosed with thyroid cancer in 2002. Then, in 2004, she was diagnosed with stage 0 cervical cancer, or adenocarcinoma in situ. The diagnosis resulted in a hysterectomy that removed her cervix and uterus, leaving just the ovaries. But relief turned to anxiety in 2011, when cervical cancer recurred in lymph nodes in her neck and in her groin. 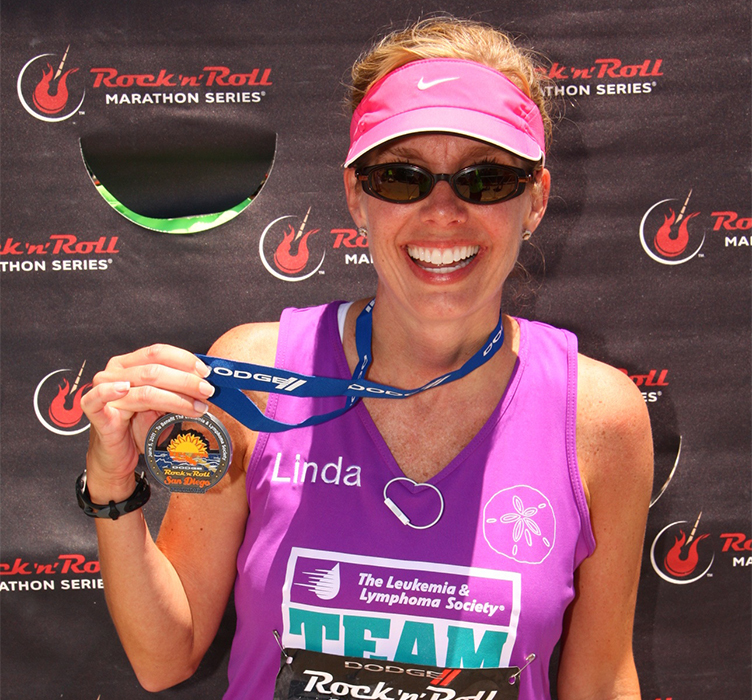 Linda made the first of what would become more than 100 flights to and from Houston, where she initiated cancer care with gynecologic oncologist Shannon Westin, M.D., of University of Texas MD Anderson Cancer Center. There, in 2012, she participated in a clinical trial involving chemotherapy drugs Alimta and cisplatin. Linda was the one participant out of 54 total who showed no evidence of cervical cancer at the end of the trial. But then, in 2016, a PET scan revealed a cancerous lymph node in her pelvis. She underwent 28 rounds of radiation, and weekly chemo — until she couldn't tolerate that anymore. Once again, Linda thought she was home free until April 2018 when, even though she'd assumed she had no ovarian function, she suddenly had terrible pain in that area. Dr. Westin ordered a scan that showed three more cancerous lymph nodes in her pelvis. Linda had her ovaries removed, and then began an immunotherapy trial — when the body's immune system is enlisted to fight cancer — but her body's protective white blood cells didn't cooperate. They didn't reproduce enough of themselves to attack her cancer cells, per the specifications of the trial, so she had to leave it and recover her strength for the next challenge. When Linda, a single mother of two sons, spoke to HealthCentral in a telephone interview, she was waiting to learn her next course of action. In the meantime, she shares five lessons she's learned about her cervical cancer treatment and her life during this process. 1. I'm going to be happy anyway. “Being miserable doesn't help. If I'm sad or angry, that lets cancer gain strength. I won't let it take over or alter my life more than it does, or give it too much power. I don't have trouble being happy — that comes naturally. 2. I embrace my wonderful support system. “I get amazing support from my two boys, and from my boyfriend, Rob Emory. He's only been with me for this most recent diagnosis, and he's been truly incredible. If I were Rob, I would have thought about running, but he hasn't left my side. I also have the most amazing girlfriends, and one in particular, Barbara Underhill, has come to the hospital with me so much. She can be funny and light, even when we go to ‘war’ together around my cancer. We play games in the waiting room before my treatments, texting back and forth while sitting next to each other. I mean, we didn't want everyone in the room to hear what we were saying! Giggling really does help. 3. My treatment isn't the same as yours. “Treatment is different for everyone, and when you start, everyone is going to tell you about their sister, brother, and friend who went through treatment. And they'll tell you the negatives of that, like, ‘Kiss your hair goodbye.’ I don't really care about losing hair, and I don't want someone to ‘put that on me,’ because other things are more important. Everyone does want to share their story, and they tell you about a million ‘cures’ and about what you should eat and do. 4. Don't Google yourself into a frenzy. “I already talked about not taking everything people tell you to heart. The same is true for internet searching about your condition. There are just too many variables when you look for and read about cervical cancer, and it's a waste of your good energy. 5. Be strong physically and mentally before you start treatment. I well remember the first time my cancer was recurrent — it had come back after a period of time of not being detected. I decided to go for a short run and it felt great. I was scheduled for a bone scan to assess the health of my bones. I said to myself, ‘I know exercise makes bones stronger, so every step I take here is doing that.’ I thought, ‘If cancer wants to take up residence in them, it's just not welcome.’ Once I am physically strong enough after my next treatment, I intend to go back to exercise.